A survivor eats a banana found in a garbage heap. EIGHT PEOPLE WERE crushed to death as a huge crowd of typhoon survivors stormed a rice warehouse near the devastated city of Tacloban, a Philippine official said this morning. “One wall of our warehouses collapsed and eight people were crushed and killed instantly,” Rex Estoperez, spokesman for the National Food Authority, the government’s rice trading agency said. Police, soldiers and private security teams were guarding the storeroom in Alangalang town, 17 kilometres from Tacloban, but were overpowered by the crowd, who carted off more than 100,000 bags of rice. “There must have been so many people to carry away so many bags of rice,” he said, adding that each bag weighed 50 kilogrammes. The spokesman said 129,000 bags had been taken – 33,000 of which were full of edible milled rice but 96,000 contained grain which could not be readily eaten. Estoperez said his agency believed looters were looking to profit by selling the grain. “Some people are really hungry but others just wanted to ransack for money,” he said, adding that the food authority was coordinating with the transport department and military to ensure that ships and trucks carrying rice would be properly guarded. The United Nations fears that 10,000 people may have died in Tacloban alone when Super Typhoon Haiyan, the strongest typhoon in the world this year and one of the most powerful ever recorded, smashed into the Philippines’ central islands on Friday. 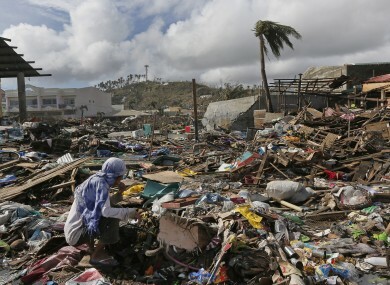 The typhoon left huge areas isolated and hundreds of thousands homeless and hungry, largely across Leyte island where Tacloban is the provincial capital. Overwhelmed and under-resourced rescue workers have been unable to provide enough food, water, medicines, shelter and other relief supplies to many survivors, and desperation has been building across the disaster zones. Hundreds of soldiers, police and armoured vehicles are deployed in Tacloban city where checkpoints have been set up and a nightime curfew imposed to help contain looting. Email “Eight killed as mob storms Philippine rice store”. Feedback on “Eight killed as mob storms Philippine rice store”.